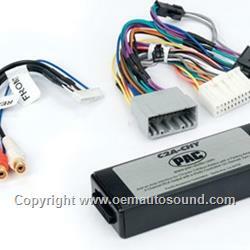 this interface converts the Chrysler Dodge Jeep digital CANN Buss digital signal and provides a stereo RCA audio output for adding aftermarket amplification. Provides full range audio output 20-20,000Hz. Audio output level is controlled by the volume of the factory radio. This interface is for use in a Chrysler / Dodge / Jeep vehicle with the REF, REC, RAQ, RAK radio and the factory installed amplifier. The radio’s name can be found on the face of the radio and the amplifier is usually branded Alpine, Boston Acoustic, Infinity or Kicker. is or has been removed from the vehicle the AOEM-CHR2 must be used instead. Either interface will connect at the radio. The C2A-CHY provides a 4-channel rca jacks output signal for use with aftermarket amplifiers. This hi low adapter uses the full range fixed level head unit output in conjunction with CAN-bus messages and delivers a analog audio signal output with fading and balancing capabilities. Only compatible in vehicles with a premium amplified audio system.